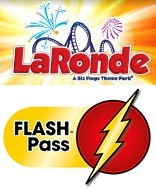 I got involved in a conversation the other day when someone was talking about LaRonde; Montreal’s amusement park. The discussion ended up veering to the price of admission and what the park was doing to earn to earn a greater profit. At this point one of my coworkers started to say that it wasn’t right that you can get special passes to jump a head of the line and not have to wait. The conversations started down the path of it not being fair, but knowing who he was talking to, he quickly changed it to him not liking this ‘legal’ line jumping to be done around other kids because they wouldn’t understand. He quickly came to realize why it was fair, if not right in this circumstance, but only after seeing what is not normally seen; which is part of what I want to share here.